Every blogger and a Google docs user must have used Google Web Fonts. Google web fonts is a huge collection of fonts available freely available for everyone and for any use. You can use Google web fonts either for your website/blog or you can also download any font for offline use on any computer platform. And now those Google Web Fonts are now available for use in Google Docs. Google has made available the huge collection of Google Web Fonts to its Google Docs users. The procedure is straightforward and anyone can add any number of fonts to the list. Once added the fonts can be used across all types of documents in Google Docs like Document, spreadsheet, presentation, drawing etc. 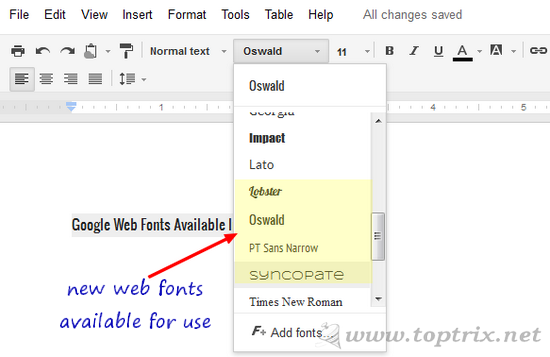 Here are a few easy steps to add your favorite Google web font in Google Docs. Go to Google Docs and click on the create the new document. 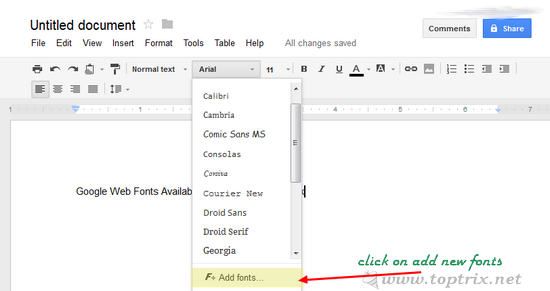 Then click on fonts drop-down menu and click on the option "add fonts" at the bottom. This will open a popup window and you have to select the web fonts of your choice to use in Google Docs. You can select as many as fonts as you want. But more the font you select, more you have to scroll through the list while using those fonts in your document. You can also delete the standard font from the list by clicking on the cross button behind the font name at the right side. Font ready to add into Google docs will be highlighted with blue color. After you have done with your selection, simply click on OK button. Now you are ready to use Google web fonts into Google Docs. What are you waiting for, start using those beautiful fonts? can i download the fonts? All these fonts can become a first choice for google doc user and they can take benefit from it. Yes, more you use the Google Fonts, more you get addicted to it. You can download the Google docs file in PDF format so that all the formatting with special fonts will be preserved.